Rice Soap is the ultimate skin delicacy here at SpaFetish®. Our natural rice soaps are made from organic Brown Rice, organic Rice Bran Oil, Sake, Shiso Leaf and Vitamin E to render a superbly exfoliating yet gentle soap bar. 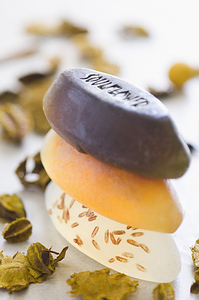 The joy of our natural rice soap is in its chic simplicity. There is nothing excessive in these purely vegan soap bars ... only earth spun ingredients, with nothing extra to pollute the perfection! We certainly cannot lay claim to being the first to create rice soap, but we can promise that our version is more spectacular whilst being drenched in a double-dip of earth friendly goodness. Thus, if you crave a vegan soap that will aptly renew withered skin, we invite you to lather up with our Rice Soap. It is the perfect vessel for a beautifully maintained body temple! In this 4 oz. natural rice soap, Black Rice and Activated Charcoal are beautifully wed with Rice Bran, Sake and Shiso Leaf to soothe and detoxify the skin. A gratis shower puff sponge is included. In this 4 oz. natural rice soap, fragrant Thai Jasmine and Rice Bran Oil, Sake and Shiso Leaf are joined by organic Rice Bran to render a lightly exfoliating and softening bar. A gratis shower puff sponge is included. In this natural rice soap, Basmati rice is generously tossed with organic Rice Bran Oil and crushed rice powder for a comforting bar that nourishes and softens the skin. 4 oz. A gratis shower puff sponge is included.